Can't play bass, drums, piano, or violin? No problem! Just point and click and you are making music. It's that easy! 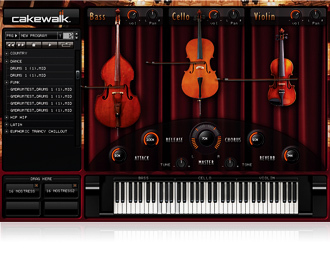 Introducing Cakewalk Studio Instruments, the world's first easy-to-use and affordable software instrument collection for Mac and PC. 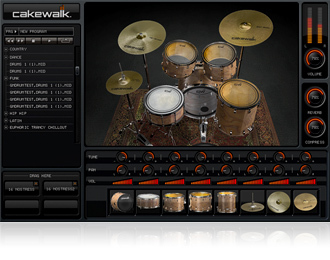 Cakewalk Studio Instruments includes a high quality Drum Kit, Bass Guitar, Electric Piano, and String Section that can be played stand alone or inside your favorite music-making software such as Cakewalk Music Creator, Apple GarageBand, Magix Music Maker Deluxe, SONY ACID Music Studio, and more. Loaded with dozens of pre-recorded drum patterns spanning several musical genres including Rock, Pop, Hip Hop, Jazz, Blues, Funk, and more, or create your own grooves and patterns with ease. 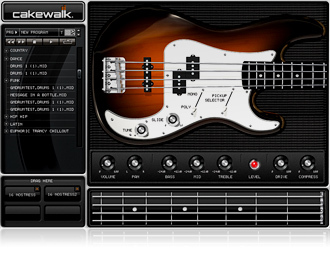 Featuring several bass guitar sounds and numerous patterns ranging from classic to modern. 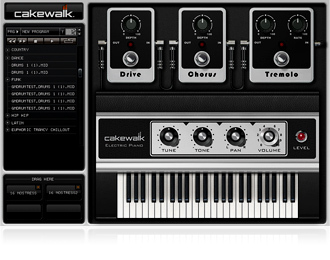 Tweak your tone with full control of Bass, Mid, Treble, Drive, and Compression.